When keeping a flock of chickens, they do seem to be a rather low-maintenance homestead staple. By providing them with food and water, free-range living and proper protection, they’re a great addition to any farm. But, keeping chickens goes far beyond tossing out some food. Whether you’re selling your eggs, or just eating them yourself, healthy chickens are a must. Here on our farm, we only feed organic, non-gmo, non-soy feed to all of our livestock (chickens, goats, pig), as well as the dogs and cats. Granted, it may cost a bit more in feed prices, but the benefits far outweigh the costs. In addition to organic food, we add ACV to everyone’s water, and add herbs to the chickens’ feed, coop and nesting boxes. One of the main herbs we use is oregano. Not only does it boost the chickens’ immune system, it also acts as an anti-parasitic and anti-fungal. The next is sage, which aids in reducing intestinal parasites. For good measure, we add lavender to the coop and nesting boxes. Lavender is proven to relax (boosting your egg production) and has antibacterial properties as well. We add marigolds to the nesting boxes and plant marigolds around the perimeter of the coop. Marigolds are a wonderful companion plant for the garden as it repels insects. Adding it to the coop and to the nesting boxes, it repels insects there, too. In addition, marigolds, if eaten by the chickens, give a darker golden (almost orange) color to the yolks. Bay leaves are insect deterrents for fleas, lice, moths and bugs. If you have room in the coop, add fresh or dried bunches of herbs, hanging within reach, so the chickens can access them freely. I would advise against hanging them in the run (unless the area is sheltered from rain) so the herbs will not mildew or rot. Some people suggest adding cinnamon to your list of herbs for chickens. In my opinion, I would advise against it. Cinnamon, when inhaled, can lead to asphyxiation. It is toxic in higher concentrations. I will, sometimes, add a touch of cinnamon to the cleaner when changing out the pine shavings, but that is in small amounts and it does dissipate as the cleaner dries. I generally use lemon rinds, soaked in vinegar, for a cleaner. After it has soaked for a week or so, I add mint to the mix before using. Mint deters mice and rats which are a danger to your flock. Speaking of mice, make sure that your feed is securely contained so that mice cannot get into it. As for the coop, mice think they’ve checked in at the Ritz-Carlton where they have an endless supply of food, water and a warm, dry place to nest and raise their babies. The first thing you have to do is block any holes that will allow mice access to the coop. You need to remember; mice can collapse to paper-flat sizes when they are trying to access doors, windows or other openings. Mouse droppings are a health-hazard to chickens. You do not want to use any type of poison because, if the mice eat it and die, the chickens will eat the mice and die, too. Using mint – peppermint, spearmint, etc. – planted around the coop and run will repel insects, too. The chickens also love having fresh mint to eat. 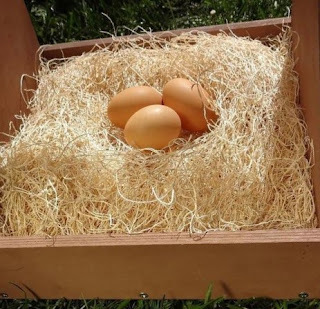 If you grow chamomile, or add dried chamomile, to the coop and nesting boxes it will also relax and calm the chickens, and it has many other health benefits, including treating worms and providing a form of calcium that helps shell strength. Toss in some dried, finely-powdered, eucalyptus leaves for an additional insecticide. 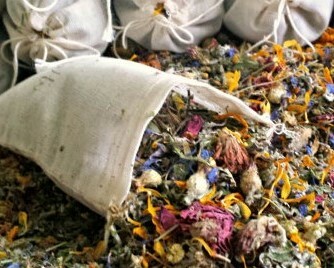 We make and sell herbal blends for nesting boxes and each blend also ships with an excelsior pad included. Contact us at celticacresfarmga@gmail.com to order.